Exercise 15 Aim: To demonstrate osmosis by potato osmometer. Principle: Osmosis is a common physical process observed in living cells and tissues of all organisms. It is defined as the movement of molecules of solvent from a region of its higher concentration to a region of its lower concentration across a selectively permeable membrane, such as the plasma membrane. Requirement: Fresh large sized potato tuber, beaker, 20% sucrose solution, water, petridish blade/scalpel, bell pin needle marked with waterproof ink. • Cut the potato tuber into two equal halves with a razor blade or scalpel. Peel off the outer skin. As the shape of the tuber is irregular, shape the two halves in squares. • Scoop from the centre of the tuber the soft parenchyma to make a small cavity of circular or square shape. The cavity prepared by scooping should have minimum thickness at the bottom. • Fill half the cavity with 20% sugar solution. Fix a pin into cavity in such a way that the mark is in line with the sucrose solution layer as shown in the Fig. 15.1. Before experiment After experiment Fig. 15.1. Potato osmometer showing osmosis •	Place the osmometer in a beaker/petridish filled with water in such a way that 2/3rd of the potato osmometer is dipped in water. • Leave the set up undisturbed for about an hour. • Observe the level of sugar solution in the osmometer at the end of experiment. • Repeat the experiment using water in tuber cavity and sucrose solution in beaker/petridish. The volume of sucrose solution inside the osmometer increases due to entry of water from the beaker as a result of endosmis. A water potential gradient is established between the sucrose solution present in the osmometer and the external water. Although living cells of potato tuber separate these two liquids, they permit entry of water into sugar solution. Interpret the results you observed when water has been used in place of sucrose solution in the osmometer (potato tuber). Questions 1. Is there any difference in water potential of sugar solution and water? 2. Why is the water potential of sugar solution more negative? 3. What will be the rate of osmosis if we use 5% sugar solution in the osmometer? 4. How does water from outside enter the osmometer? Does it pass through cells of the tuber? Exercise 16 Aim: Study of plasmolysis in epidermal peel of leaf. Principle: Living cells aregenerallyturgid due to the presence of water.When cells are immersed in hypertonic solution, shrinkage of protoplasm takes place with visible separation of plasma membrane from the cell walls. This is called plasmolysis and occurs due to exosmosis, a phenomenon in which water from the cells moves into the surrounding medium which is hypertonic, that is more concentrated than the cell sap. Requirement: Leaves of Rhoeo/Tradescantia; 20% sucrose solution, slide, cover slip, needle, petri dish /watch glass, microscope. • Carefully prepare thin and transparent epidermal peels from the coloured epidermis by tearing the leaf or with the help of a blade. Select four thin peels, keep them in water in a watch glass to avoid dehydration. • Mount peel 'A' in a drop of water on a glass slide, place a cover slip and observe under microscope. Observe the peel after 5, 15, 20 and 30 minutes. • Place the other peels B, C, D and E in 20% sucrose solution. • Observe the peels B, C, D and E after 5, 15, 20 and 30 minutes Time (minutes) Total no. of cells in a field of microscope (M) No. of Cells showing plasmolysis (N) % of plasmolysis ⎛ ⎞⎜ ⎟⎝ ⎠ N × 100 M Peel A (control) 5 15 20 30 Peel B 5 Peel C 15 Peel D 20 Peel E 30 respectively under microscope. Observe the changes in cells. Record the observations in the table. A normal cell Cell in the process of plasmolysis A plasmolysed cell Fig.16.1. Different stages of plasmolysis in a plant cell • Restrict your observations to cells with coloured protoplasts only. • Draw diagrams of the cells you observe in each of the peel (Fig.16.1). Tabulate your observations in the given table. Cells in the peels B, C and D will exhibit plasmolysis. Questions 1. Why do cells of peel A kept in water remain turgid? 2. Why is plasmolysis observed in cells of peels kept in sucrose solution? 3. What will happen if the plasmolysed peels are transferred to water? 4. Name the hypertonic and hypotonic solutions used in the experiment? Exercise 17 Aim: Study of imbibition in raisins or seeds. Principle: The first indication shown by seed that will germinate is that it swells in volume by absorbing water, by a process called imbibition. Imbibition is a special type of diffusion where water is absorbed by solids (colloids) causing them to increase enormously in volume. The tissues of seeds contain several hydrophilic colloidal biomolecules. Water molecules from the external medium get attracted towards them and enter in seeds/raisins. Requirement: Raisins (dry grapes), dry seeds of gram, green moong, 2 measuring cylinders of 100ml volume, water, balance and weights. • Take two measuring cylinders of 100ml capacity, mark them A and B. • Take 30ml of water in each cylinder. • Weight 25 g each of raisins and dry seeds and put them separately in cylinder A and B; and note the volume by rise in water level, as initial volume (X). • Allow the raisins and seeds to soak in the same cylinder for 1 hour. • Remove the raisins and seeds from measuring cylinder and blot the water by blotting paper. • Remove the water from the cylinders and take 30ml of water again in each. Again put the soaked raisins and seeds, in the respective cylinders. Note the volume by rise in water level, as final volume (Y). • Calculate the increase in the volume of raisins or seeds by taking the difference of X and Y (Y–X). • Remove the raisins and seeds again and take the final weight and calculate the increase in weight by taking the difference of final and initial weight. Record your observation in the given table: Measurement of Weight Material Initial Weight(M) Final Weight (N) Difference of Weight (N–M) = O O ×100 M % of water imbibed Raisins (A) 25g Seed (B) 25g Measurement of Volume Material Initial Volume (Volume of the dry raisins or seeds) Final Volume (Volume of the soaked raisins or seeds) Increase in volume (Y–X) = Z % of water imbibed ⎛ ⎞⎜ ⎟⎝ ⎠ Z ×100 X Initial Reading Final Reading Difference X Initial Reading Final Reading Difference Y Raisins (A) Seeds (B) Raisins/seeds swell gradually with passage of time. Questions 1. It becomes difficult to shut wooden window panes and doors during rainy seasons. Why? 2. Why do we store grains/seeds in moisture free containers? 3. Though both osmosis and imbibition are associated with movement of water molecules, the two are different processes. Explain. 4. Will imbibition occur if seeds/raisins are kept in a beaker containing alcohol? Exercise 18 Aim: To study the distribution of stomata on the upper and lower surfaces of leaves. Principle: Stomata are tiny microscopic structures present in leaves of all flowering plants. Number and distribution of stomata per unit area is variable in leaves of different plants. A typical stoma consists of a pair of guard cells enclosing an aperture in the center called the stomatal aperture. Stomata perform two important functions; that of, transpiration and exchange of gases. Requirement: Leaf samples - (Hibiscus/Balsam/Bougainvillea/Petunia/Cassia/Solanum/any broad-leaved dicots and grass) microscope glass slides, cover slips, water, needle, brush, and petridishes/watch glasses. • Prepare thin peels of upper and lower epidermis of a grass leaf and of any two dicot leaves by tearing the leaf or with the help of a razor blade and keep the peels in separate watch glasses/petridishes. • Mount the upper epidermal peel in a drop of water taken on a slide. Carefully cover the peel with cover slip so as to avoid air bubbles. • Focus the peel under the high power of microscope. Note the presence/absence of stomata seen in the field of microscope. Count the number of stomata seen in the microscope field. Draw figure of stomata giving details. • Now repeat the same with peels of lower epidermis. Record your observations in the table given below. Name of the plant No. of stomata in the microscopic field Shape of guard cell Upper epidermis Lower epidermis Dicot leaf Sample A Sample B Monocot leaf Sample C Carefully examine the results recorded for the leaf samples. Is the number of stomata more in lower epidermis or in the upper epidermis? Correlate the number of stomata with rates of respiration and exchange of gases. Questions 1. Name the processes that will be affected if stomata were not present in leaves. 2. 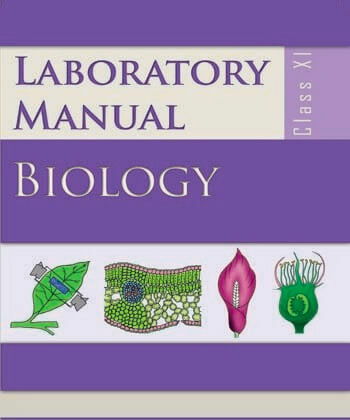 Draw the figure of a stoma you have observed in a monocot leaf and compare it with the shape of stomata in dicot leaf. 3. In land plants, stomata are generally more on the lower epidermis than on upper epidermis. What is the advantage? Exercise 19 Aim: To demonstrate difference in rate of transpiration between two surfaces of leaf. Principle: Transpiration is loss of water in the form of vapour from the leaves and other aerial parts of the stem. About 85% of transpiration takes place through the stomata. Some amount of water is also lost through cuticular transpiration. Rate of transpiration depends upon several factors like light, temperature, wind, humidity and also on the size, type, number and distribution of stomata on the leaves. You have noticed in Experiment No.18, the distribution and number of stomata on the two surfaces of leaf varies. In majority of plants, especially in dorsiventral leaves, number of stomata is more on the lower epidermis than the upper epidermis. Transpiration can be easily demonstrated by cobalt chloride paper test. Cobalt chloride is blue coloured in anhydrous (dry) form but turns pink when it comes in contact with water. This property of cobalt chloride is used to demonstrate that water is lost during transpiration. We can use the time taken for change of colour from blue to pink to measure the rate of transpiration as effected by various external factors mentioned above. Requirement: A herbaceous broad leaved plant, filter paper, 5% cobalt chloride solution, hot plate/oven, wire gauze, cellotape, dessicator, slides, rubber bands. • Prepare 100 mL of 5% cobalt chloride solution by dissolving 5g of cobalt chloride in 100 mL distilled water. • Cut filter paper into small strips and immerse them in cobalt chloride solution taken in a petridish for 3-5 minutes. • With forceps, transfer the soaked strips on to the wire gauge and allow excess CoCl solution to2drain off. • Dry the filter paper strips on hot plate/oven taking care not to burn or char the paper. The anhydrous cobalt chloride coated strips will be blue in colour. Store them in a dessicator. • Select a leaf of a potted plant growing in sunlight. If water droplets are seen blot the leaf dry with cloth/blotting sheet.• Keep one dry (strip) cobalt chloride paper on the upper surface of leaf and stick it with cellotape. Similarly stick another strip of CoCl2 on the lower surface. The CoCl2 strips can be held in position with the help of two slides and rubber bands (Fig. 19.1). • Place the potted plant in sunlight. Name of Time taken for change of the colour from blue to pink ( in minutes) the plant 2 4 6 8 10 12 14 16 18 20 Upper epidermis Lower epidermis Observe the colour of cobalt chloride paper attached to both surfaces of leaf at regular intervals and note down your observations in the table provided. Note: Put (√ ) mark for change in colour and (X) mark if there is no change in colour. It will be observed that the filter paper attached to the lower surface turns pink much faster than the strip on the upper surface. This is because the number of stomata are generally more in the lower epidermis than in the upper surface. As a result, the amount of water vapour lost by transpiration from the lower surface is more than the upper surface. Questions 1. What is the reason for the colour change observed cobalt chloride paper? 2. What result would you observe if the cobalt chloride experiment is carried out in dark conditions? 3. Why is midday or afternoon the ideal time to perform the experiment to study rate of transpiration? 4. Name any two external factors, which affect the rate of transpiration. 5. Does transpiration take place in aquatic plants? Exercise 20 Aim:	To detect the presence of carbohydrates like glucose, sucrose and starch. Principle: Carbohydrates with the free aldehyde or ketone groups (i.e., simple sugars) reduce copper sulphate of Benedict and Fehling's reagent to cuprous oxide forming a yellow or brownish-red coloured precipitate depending on the concentration of sugar. Colour Approximate amount of reducing sugar No change of blue colour Blue changes to green precipitate Blue changes to yellow precipitate Blue changes to orange-red precipitate Blue changes to brick-red precipitate Absence of reducing sugar 0.1-0.5 % of reducing sugar to 0.5 to 1.0% of reducing sugar to 1.0-2.0 % of reducing sugar Over 2.0 % of reducing sugar Requirements: Glasswares - test tubes, funnel, beaker; Chemicals - Benedict's solution, Fehling's solutions A and B; concentrated HCl, saturated solution of NaOH, dilute iodine solution; Equipments - water bath; Miscellaneous - test tube holder, test tube stand, spirit lamp. Sample for test: Fruit juice of apples/banana/leaves of onion/sugar cane extract, milk, etc. Preparation of reagents (i) Benedict's reagent: Mix 173g of sodium citrate and 100g of anhydrous sodium carbonate in 600mL of water in a beaker and warm gently (solution A). Dissolve 17.3g of hydrated CuSO4 in 100mL of distilled water (solution B). Add solution B to solution A with constant stirring. Cool and transfer to a one litre flask and make upto the mark with water. (ii) Fehling's reagent A: Dissolve 6.93g of copper sulphate in 100mL of distilled water. (iii) Fehling's reagent B: 20g of KOH and 34.6g of sodium-potassium tartarate (Rochelle’s salt) dissolved in 100 mL of distilled water. A. Test for glucose Take small pieces of banana, apple and grapes. Crush them separately and strain their juices in different test tubes. Take milk in another test tube. Cut fresh leaves of onion bulb into small pieces and boil for 2 to 3 minutes in a test tube and filter it. (a) Benedict's test • Take 2 mL of juice (fruit extract) / milk / onion leaf juice in a test tube. • Add 2 mL of Benedict's reagent to it and boil. Direct heating of test tube should not be done. It should be carried out in a water bath at the boiling point of water. • The colour changes from blue to green and finally to orange or brick red indicating the presence of simple sugar (glucose). Benedict's Test Name of the food items Co lour of the Precipitate Inference drawn 1. Apple juice 2. Banana extract 3. Grapes juice 4. Onion juice 5. Milk 1. 2. 3. 4. 5. _____________________ _____________________ _____________________ _____________________ _____________________ 1. ____________________ 2. ____________________ 3. ____________________ 4. ____________________ 5. ____________________ (b) Fehling's test • Mix equal volume of Fehling's solution A and B (1-2mL) in a test tube. • Add equal volume of the fruit juice or onion leaf juice or milk and place it in water-bath at the boiling of water. • The initial blue colour turns green to yellow and finally a brick-red precipitate is formed. Fehling's Test Name of the food items Co lour of the Precipitate Inference drawn 1. Apple juice 2. Banana extract 3. Grapes juice 4. Onion juice 5. Milk 1. 2. 3. 4. 5. _____________________ _____________________ _____________________ _____________________ _____________________ 1. ____________________ 2. ____________________ 3. ____________________ 4. ____________________ 5. ____________________ Exercise 20 B. Test for Sucrose Collect sugarcane juice or cut sugarbeet into small pieces. Crush them and strain their juice. (a) Benedict's and Fehling's test • Perform Benedict's and Fehling's test with cane sugar or sugar beet juice as described above. • No change of colour indicates the absence of simple sugars (i.e., monosachharides). (b) Hydrolysis test • Take 10 mL of sample juice in a beaker, add few drops of concentrated HCl and boil. • After cooling, add 4 mL of saturated solution of NaOH or Na2CO3 to neutralize the solution. Now divide the solution into two parts. Transfer one part in test tube 'A' and the other in test tube 'B'. • Perform Benedict's test with sample in test tube 'A'. Do you observe any change in colour? If there is a change, it indicates the presence of simple sugar or monosaccharides. • Perform Fehling's test with sample in test tube 'B'. Do you observe any change in colour? If there is change, it indicates the presence of simple sugar or monosaccharides. C. Test for starch (Iodine test) Principle: Iodine specifically makes a blue-coloured complex with starch. • Add 1 or 2 drops of dilute iodine solution to 2 to 3mL of extract. • A blue-black colour shows the presence of starch. • The blue colour disappears on heating and reappears on cooling. The composition of blue coloured substance is not well defined. This may be an adsorption complex of starch with iodine rather than a definite compound. Questions 1. What is the use of HCl in the test for carbohydrate? 2. Why does the blue colour disappear on boiling and reappear on cooling in the test for starch? 3. Sucrose solution gives a negative test with Benedict’s test. Why? 4. Will Iodine test give a positive result with glucose, fructose or sucrose solution? 5. Why are monosaccharides called reducing sugars?